Many constitutive soil models enable you to represent a wide range of soils or structural materials. In addition, SIGMA/W models pore-water pressure generation and dissipation in response to external loads. With SIGMA/W you can analyze almost any stress or deformation problem you will encounter. GeoStudio's Analysis Tree models even the most complex construction sequences. Analyses are added to the Tree, forming a Parent-Child relationship in which each new analysis represents a part of the construction sequence. The coupled stress and pore-water pressure formulation can be used to model construction sequencing involving fill placement, excavation, and soil-structure interaction. The stresses and/or pore-water pressures from a SIGMA/W analysis can be used directly in SLOPE/W to do a stress-based stability analysis. Stress redistribution analysis is used to conduct a strength reduction slope stability analysis, model stress transfer onto structures such as pile walls installed within failed slopes, or calculate permanent deformations. Before construction of a new airport in Bangkok, Thailand, full-scale test embankments were constructed on the site to study the effectiveness of prefabricated vertical drains (PVDs) for accelerating the consolidation and dissipation of the excess pore-pressures resulting from fill placement. In the 1970’s, a series of test embankments were constructed on soft clay at Cubzac-les-Ponts in France. These full-scale field tests were well-instrumented and are well-documented, and consequently provide an excellent case history. Two of the embankments are the subject of this article. The primary objective of this example is to consider the change in pore-water pressure during an excavation below the watertable, particularly the potential for negative pore-water pressures to form. A secondary objective of the example is to demonstrate the use of a moving hydraulic boundary condition on the excavation face. Halim and Wong's paper in Underground Singapore 2005 presents six case histories where deflections of the shoring walls were measured during construction. The case histories show that GeoStudio has the capabilities to model the behavior of deep shored excavations in soft ground. Create a SIGMA/W analysis and set up the problem workspace. Choose the analysis type, such as Insitu stress, stress redistribution, load/deformation, coupled stress/pore-water pressure, volume change, and dynamic deformation. Define the material properties for your analysis, assign them to regions on the domain, and then define your initial pore-water pressure conditions. Define materials using total stress parameters, effective drained parameters or effective parameters with pore-water pressure changes included. Define the initial pore-water pressure conditions for transient scenarios using results from other SEEP/W or SIGMA/W analyses, defined spatial functions or draw an initial water table. Define stress/strain boundary conditions to simulate stress and fluid pressure conditions or displacement/force conditions to be placed on the domain. Hydraulic boundary conditions can also be added to simulate total head, pressure head, pore-water pressure, water flux (q), water rate (Q), and climatic conditions. Time-varying loading and hydraulic functions can be defined to simulate changing conditions over the duration of a transient analysis. 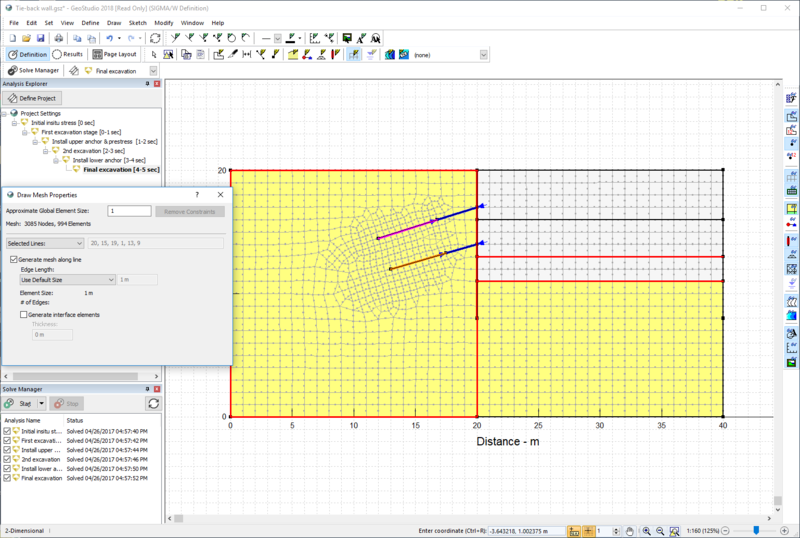 Structural beams and bars can also be applied to the model domain. Open Draw Mesh Properties to refine the mesh drawn on the entire domain, or along specific geometric regions, lines or boundaries. Interface elements can also be created to simulate frictional properties between materials or between a soil and a structure. When your problem is completely defined, start the analysis process in the Solve Manager window. The Solve Manager displays the solution progress, allowing you to cancel or stop/restart if necessary. While the solution is in progress, you can look at preliminary results in the Results window. When the Solver is finished, the Y-total stress contours are displayed, with displacement results displayed as either a deformed mesh or vector arrows. Many other contour options are available in the Draw Contours window, including pore-water pressure, material properties, water flow, and gradients. Contour legends and properties can also be modified. Labels can be added to contour lines in Results View. Liquefaction zones following an earthquake can also be displayed. Interactively select any node or gauss region to view result information, including resulting displacement, pore-water pressure, material properties, and more. Draw Mohr Circles to review the stress/strain state of any node or gauss region. Display plots of computed results over the x- or y-direction or create time-varying plots of results in transient analyses, such as displacements, pore-water pressure, total or effective stresses, and more. Generate reports of the definition and results, and export into other applications such as Microsoft Excel for further analysis. SIGMA/W offers simple but powerful analytical capabilities when used in combination with other GeoStudio products. There are many geotechnical cases where it is desirable to not only perform a deformation analysis, but also to look at stability. In other instances, a SLOPE/W limit equilibrium stability analysis alone is inadequate. For cases like this, the SIGMA/W computed stresses can be used in SLOPE/W to compute the safety factors. Simulating the placement of fill in SIGMA/W, for example, may create excess pore-water pressures in the foundation. These SIGMA/W excess pore-water pressures can be used in SLOPE/W to analyze the stability during construction and at the end of construction. This could help with designing sub-surface draining or staging the loading. SEEP/W pore-water pressures can be used by SIGMA/W to simulate in situ effective stresses. Excess pore-water pressures generated during any kind of loading (for example, fill placement) can be used in SEEP/W to study how long it will take for the excess pore-water pressure to dissipate. This can help with specifying the rate of loading. Establishing insitu static stresses can be done simplistically in QUAKE/W. Alternatively, you can use the load sequencing and non-linear constitutive soil models in SIGMA/W to improve the estimation of the static stress conditions, and then use them as the initial static stresses in a QUAKE/W dynamic analysis. Stress and liquefaction results from QUAKE/W can be used in a SIGMA/W stress redistribution analysis. The dissipation of excess pore-water pressures generated during earthquake shaking may lead to consolidation after the earthquake. Using the QUAKE/W computed pore-water pressures in a SIGMA/W consolidation analysis makes it possible to look at the deformation that may occur as a result of an earthquake.